Have you ever had a customer who is late to pay you? It is SO FRUSTRATING!!! You’ve done all the hardest parts: Marketing, getting a customer, and actually delivering all while surpassing expectations. Then you send them an invoice and it just gets awkward and it seems like they hate you all of a sudden. Even though you’re the best supplier ever! Invoicing is usually the biggest part of struggling Accounts Receivables which really hurt your overall Cash Flow. So Let’s Fix it! We use words like Psychology and Benefit that might seem out of place when it comes to invoicing. Bear with me, because we people aren’t as logical as we think we are! So we’ll use some straightforward tactics and we’ll use some psychological tactics. The point is that if you have late or non-paying customers, something needs to change! Some of the work you do is directly benefiting the customer and some of it is not, but has to be done, and you need to be paid for it. In Six Sigma we call this Non Value Added but Necessary. So when you’re invoicing, make sure you focus the line items on the value-added activities or benefits to the customer. Then put the non-value-added-but-necessary items in the price of the benefits that it was leading up to. Don’t lie about it, but make sure you’re focusing on what value was delivered instead of just saying that you spent 62 hours analyzing data. 2. Update Your Invoices EVERY DAY! Get in the habit of updating the invoice as you do the work. Waiting means it’s going to take you longer to remember what you did and harder to put down exactly what happened. You are much more likely to undercharge if you wait. As an added bonus, you look very professional if you can respond quickly when your customer asks you about invoice status. Sending an invoice immediately makes sure the customer remembers the value of what you did when they receive the bill and it starts the clock on payment incentives. Waiting three weeks to send an invoice is just a horribly inefficient process and an unnecessary ding to your cash flow. < link! Make sure there is a section in the contract that says what your agreed payment terms are, such as invoicing frequency, payment expectations, payment method, or late payment fees. Make sure you reference the contract that you have on the invoice. Keep in mind that quite often the bookkeeper is doing invoice payments in a silo, so doing this will make it less likely to be kicked up the chain for approval. 54% of UK companies in a survey said that invoices were being sent to the wrong place! Make sure you use the right billing address. Some companies require specific items on any invoice that comes to them, such as a purchase order number, EIN, specific part numbers or descriptions of services. Any company that has this requirement should be able to provide you with a written policy that says what is needed. Make sure you get a copy of their invoicing terms to avoid the processing feedback loop. Many accounting software packages have an invoicing process. Just make sure you are using that feature. Alternatively, there are lots of free options that you can find by searching for free invoicing software. I have even used a Word template with my Logo. Different colors are perceived to mean different things. Blue tends to convey competence, quality and corporate. Green conveys good taste and growth. Red conveys excitement and power. In fact, the color red seems to evoke a faster response time than blue or black. Don’t get too crazy with color, but consider if you can look professional and mix in some coloring such as a dark blue font instead of a black font with a red price. Get creative and make sure you have someone double check that you’re not going too wonky if you’re not a designer. You can use some psychological pricing tricks to make the dollar amount on an invoice seem smaller than it is. Yes, this stuff is legit. For real. 9. Say Please and Thank You! Your mother taught you better than that! Saying please and thank-you on the invoice has been proven to increase your chances of getting paid. In fact, say this exactly: “Thank you for your business, please pay within 21 days”. You should do the math for your customer so that it’s clear what day you think is the due date. This avoids any issues with calculating or miscalculating the date. Make it as easy as possible for them to pay you! 11. Use Email, Electrons are Faster and Than Snail Mail! People check their mail one time a day but check their email hundreds of times per day. Send your invoices by email instead of by postal service. This will cut out at least two days’ worth of shipping time and probably reduce the amount of time it takes for your customer to process the paperwork. You can set a policy that says you don’t do paper invoices just to enforce this. You can even call it a “green initiative” (wink wink). You can also include a link to an online payment portal. 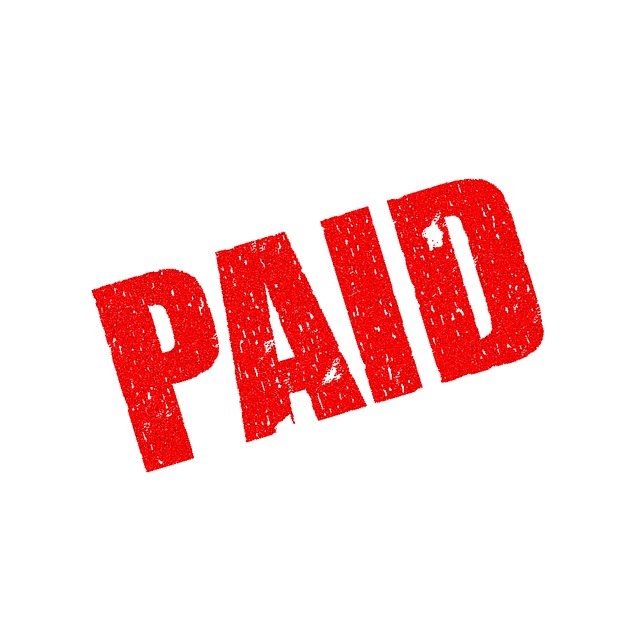 It may be worth adding an early payment incentive such as a 2% discount for paying within 10 days of the invoice date. 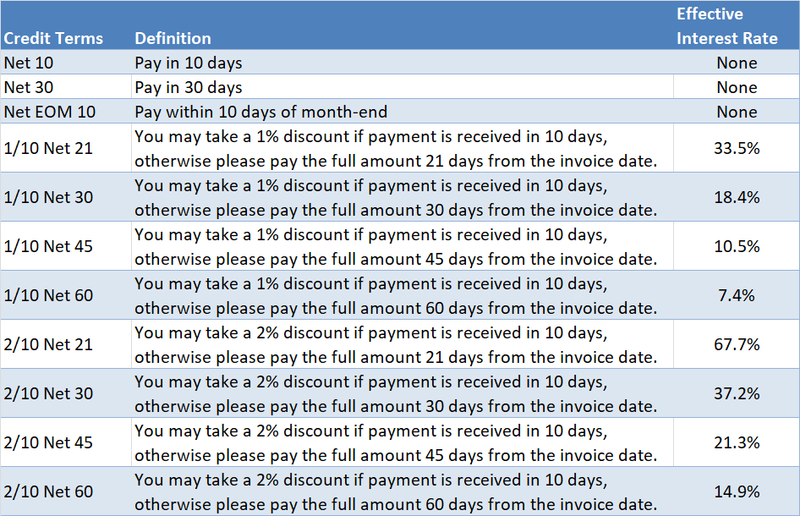 2%/10 net 30 means that you will discount the invoice by 2% if you receive payment within 10 days of the invoice date. The only issue with doing this is that the effective interest rate bonus of 2% net 10 is equivalent to 37.2% APR, which is exactly why it works. I included a table below illustrating common Credit terms and a calculation of the effective interest rate. Keep in mind that you can put these terms on a sheet, but you need to balance that with being polite and using plain English as we stated earlier. Table 1. Calculated effective interest rate of common payment terms. It costs you money when your customers pay late. So charge them for it. It is a standard business convention to charge for being late, so customers should not be surprised if you charge a late fee. 58% of UK Companies in a survey said they paid late fees. You should charge a rate that is higher than a bad credit card, and higher than your cost of capital. Being late might put you out of business. Being late on payment is unethical at best and a violation of your contract terms at worst. Track when you sent invoices, when terms changes occur and when any interactions on an invoice or payment have occurred. There are many tracking systems available for this if you get to a point where the cost is justified. Make sure you stay at the top of their mind. Re-send the invoice so it arrives right before payment is due. Send it again on a regular basis and make sure you send a “past-due” notice in big red letters if they are late. The more ways you have for someone to pay you the better chances that they’ll pay right away. Make sure you give clear directions on how you can be paid. If a customer needs a specific way to pay, then try to be accommodating. In the event that you don’t normally accept a specific method, but a customer specifically wants to use it, you may be able to include a processing fee for having to do the setup work. Choose 3 of these to do right away. Then watch for which ones improve your Receivables statistics and keep doing the ones that work. Thanks for every other fantastic post. Where else may just anybody get that type of information in such a perfect method of writing? I have a presentation subsequent week, and I’m on the search for such information. Hurrah! After all I got a web site from where I know how to genuinely get valuable data regarding my study and knowledge. Way to go on this post man. Really killer stuff. I’ll be back to read your other posts.